Gravy's bouncy rock delivery smacks you in the face with cleverness from the opening lines of "Girlfriend", where the lyric proclaims that the band "got a drummer but he wants to sing". From there, this NYC quartet's straight-ahead, pull no punches brand of rock stays the course by laying down the perfect amount of riffs and heartfelt emotions to knock a few beers back and shoot some pool to. Tracks like the garage rock flare of "Anatomy" and the sad and lonesome feel of "Hollow Place" run the gamut of what goes down at the local watering hole on any given Friday night, speaking out to Gen X'ers in Anywhere, USA. 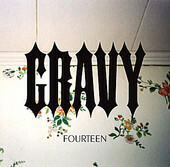 Gravy also display the kind of solid spirit found in the bands like Cheap Trick and Soul Asylum, and even though this outfit can easily be lumped in with tepid acts like Three Doors Down and Matchbox Twenty by possessing similar rock posturing, the hard rocking zeal found on tracks like "New Home" and "Find It" is unmatched by the band's peers, giving Gravy the edge over the usual leftovers.